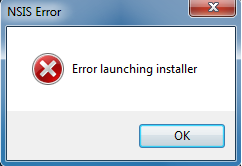 If you get the NSIS error while installing software on your computer, then the software has failed the integrity check, and is either corrupt or damaged. A virus on you computer may have corrupted the file. To overcome this problem, update your anti-virus software and scan your computer for viruses. Go to "Start," click on "Run," type "cmd" in the text box, and then click on "OK."
On to the black window that opens up, click and drag the software installation file icon that you wish to install. For example, suppose you want install Google Talk on your computer and the setup file (googletalk-setup.exe) is stored in the "C:\Software" folder. Click and drag the "googletalk-setup.exe" icon from the Software folder, onto the black window. Once you have dragged it, the entire path (C:\Software\googletalk-setup.exe) shows up on the black screen. Press the spacebar on your keyboard and type "/NCRC". In our example, C:\Software\googletalk-setup.exe /NCRC.